The Pontifical Equestrian Order of Saint Sylvester Pope and Martyr (Latin: Ordo Sancti Silvestri Papae, Italian: Ordine di San Silvestro Papa), sometimes referred to as the Sylvestrine Order, or the Pontifical Order of Pope Saint Sylvester, is one of five Orders of Knighthood awarded directly by the Pope as Supreme Pontiff and head of the Catholic Church and as the Head of State of Vatican City. This Order was at one time united with the Order of the Golden Militia. Pope Pius X in his motu proprio of 7 February 1905, entitled Multum ad excitandos, divided the Sylvestrine Order into two Orders of Knighthood, one retaining the name of St. Sylvester and the other taking the ancient name of the Order, i.e. Order of the Golden Militia, or Order of the Golden Spur. It is intended to honor Roman Catholic lay people who are actively involved in the life of the church, particularly as it is exemplified in the exercise of their professional duties and mastership of the different arts. It is also conferred on non-Catholics and in the UK current recipients include prominent Anglicans, Muslims and Jews. Awards of the Order are generally made on the recommendation of Diocesan Bishops, or of Apostolic Nuncios (nominations may be made by parish priests to their bishop for his consideration). Awards are also granted on recommendation of the Papal Secretary of State. Pope John Paul II extended membership in the Order to ladies as well as gentlemen. Awards of the highest rank of Knight or Dame Grand Cross are exceptional and currently there is only one holder of this rank in the UK and Ireland, and one in the United States, Mary Bruemmer of Saint Louis University. Prior to the year 1841 it was known as the Militia of the Golden Spur or Golden Militia, and though it is not historically established who among the many supposed founders is the true one, yet it undoubtedly is the oldest and, at one time, was one of the most prized of the papal orders. Faculties granted to the Sforza family, to the College of Abbreviators and to bishops assistant at the throne to create Knights of the Golden Militia resulted in lavish bestowal and diminished prestige of the decoration. Pope Gregory XVI in his Papal Brief of 31 October 1841, entitled Quod hominum mentes retained the ancient name of the Order and placed it under the patronage of St. Sylvester (one of its alleged founders). He withdrew all faculties to whom and by whomsoever given, and forbade the use of the title or the decoration to all knights created by any means other than a Papal Brief. To restore the Order to its ancient glory and splendour, he limited the number of Commanders to 150 and knights to 300 (for the Papal States only), and appointed the Cardinal of Apostolic Briefs as Chancellor of the Order, with the duty of preserving the name, grade, number and date of admission of each knight. Commander wore a large-sized decoration suspended at the neck, on a wide ribbon. Knight wore a small-sized decoration on the left side of the breast, on a smaller ribbon. The decoration or cross of the Order, according to Pope Gregory's Brief, was an eight-pointed gold cross with an image of St. Sylvester wearing the tiara on its white enameled centre, and around this centre a blue enamelled circle bearing in letters of gold the inscription SANC. SYLVESTER P. M. On the reverse side, in golden characters, was stamped MDCCCXLI GREGORIUS XVI RESTITUIT. A small golden spur hung suspended from the two sides of the foot of the cross of the Order to mark the unity of the Sylvestrine Order with that of the Golden Militia. The ribbon of the decoration was of silk composed of five strands, three of which were red, and two black. The golden chain worn around the neck by members of both classes had the decoration with its tiny golden spur suspended from it. The official uniform was a red evening dress coat with two rows of gold buttons with green collar and facing. The gold embroideries of the coat were of a more ornate design for Grand Crosses and less so for Commanders and Knights. White trousers, with gold side bands, hat with white plumes and a sword with a silver hilt and also gilt spurs, completed this rarely used costume. The current decoration or cross of the Order is a gold cross of white enamelled surface, in the centre of which is impressed the image of St. Sylvester, surrounded by a blue enamelled circle bearing the inscription in letters of gold SANC. SYLVESTER P. M. On the obverse, in the centre, are the Papal tiara and crossed keys with the date of the Order's restoration under Gregory: MDCCCXXXXR, and that of the Pius X renovation, MDCCCCV, impressed in characters of gold upon a blue circle. The ribbon of the decoration is black silk with three narrow red stripes. The star or badge is the cross of the Order attached to a silver star. The official uniform is a black coat ornamented with one row of gilt buttons, black velvet, gold-embroidered collar and cuffs, black gold-striped trousers, a bicornered cocked silk (bicorne) hat with a cockade of the papal colors to which is added a white plume when worn by a Knight Grand Cross, a black plume when worn by a Commander, and a sword. 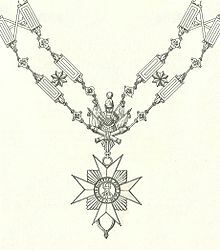 Knights Grand Cross wear a sash and a badge or star on the left side of the breast; Commanders wear a cross around the neck; and Knights wear a smaller cross on the left breast of the uniform. The uniform is considerably more embroidered for the higher ranks and white gloves are usually worn. In ecclesiastical heraldry, laypersons awarded the rank Grand Cross display a blue enamelled circle bearing the inscription in letters of gold SANC. SYLVESTER P. M around the shield in their coat of arms, while other ranks place an appropriate ribbon below the shield. Papal knights and dames do not have any specific obligations by virtue of their having been given the personal honour of membership in an Order. However, it is customary for them to be invited to participate in major events of their diocese, such as the consecration of Bishops, the ordination of Priests, and the introduction of a new Bishop into his diocese. On such formal occasions they would wear the uniform of the Order. In the 1960s Pope John XXIII created Oskar Schindler, German industrialist and Yad Vashem honouree as Knight Grand Cross of the Order. In 1945 Pope Pius XII created Ken Harada, Japanese envoy to the Holy See, into the order. In July 1944 Pope Pius XII created Major General William Joseph Donovan, father of the CIA, Knight Grand Cross of the Order. George Borg Olivier, Prime Minister of Malta, Knight Grand Cross of the Order. Karl August, 10th Prince of Thurn and Taxis, German Prince, Knight Grand Cross of the Order. Joseph Flores, Governor of Guam. Jagatjit Singh of Kapurthala Maharaja of Khapurthala. Sir Burton Hall Chief Justice of The Bahamas and Justice of the UN International Court at The Hague, Knight. Rabbi Arthur Schneier, Austrian-American Holocaust survivor, clergyman and activist. Austin Mardon, Canadian author, community leader, and advocate for the disabled. Catherine Mardon, Canadian author, activist, and lawyer. 1932: Count Maurice de Patoul, Grand Marshall of the Royal Court. 1945 : Count Pierre Ryckmans. Ludwig Pollak, Czech-born Art historian, museum director in Rome, Knight Commander. Anthony Bailey inter-faith campaigner, Knight Grand Cross. General Sir Richard Lawson, Commander-in-Chief of Allied Forces Northern Europe, Knight Commander. Professor David Khalili, art collector, Knight Commander. Mahmoud Khayami businessman and interfaith campaigner, Knight. There are National Associations of Papal Knights in France, Great Britain, Ireland and the United States, as well as Diocesan Associations such as those in Milan and Los Angeles. ^ "Pope Francis to bestow knighthood on New York rabbi". Jewish Telegraphic Agency. Retrieved 23 April 2015. ^ Museo Barracco, Storia della collezione, Quaderno 2, ed. by Maresita Nota Santi, Orietta Rossini, and Elena Cagiano de Azevedo, Commune di Roma, 2000. This article incorporates text from a publication now in the public domain: Herbermann, Charles, ed. (1913). "Order of Saint Sylvester" . Catholic Encyclopedia. New York: Robert Appleton. Battandier, Ann. Pont. Cath., 1901, 483 sqq. ; 1902, 468 sqq. ; 1908, 646 sq. For a list of knights of all the decorations see Ann. for 1905. 1907, and 1908; Pii IX P. M. Acta, Part I, 43 sq., 195 sq. ; IV, 391 sq.